ST-YGF series animal oil filling machine has two different kinds for choice,rotating and linear.Filling volume is between 250ml and 2000ml.Intelligent control with LCD make the filling accurate and no leaking.A overload protection is designed at the star-wheel,where the bottles are in and out.When something wrong,the protection device will alarm and stop the process.The animal oil filling line consists of animal oil filling machine ,washing machine,tunnel sterilizing,labeling machine and packing machine. Germay SIEMENS PLC and touch screen control make it intelligentize protection function.Vacuum anti-dropping device ensures no leaking situation in production. Electrinic ajusting for volume system, frequency control and photoelectric detecting system are app lied in animal oil filling machine. 1.Animal Oil Filling Machine applied SIEMENS PLC computerized control. 2.Animal oil filling equipment has intellectual,protection function. 3.Vacuum drop prevention device guarantees there should be absolutely no drop or leakage during production. 4.There is a switch for step progressive type supply and continuous supply. Animal oil filling equipment can be Set Optionally. 5.Animal oil filling machine has applied imported pneumatic control parts. 6.Animal oil filling equipment has applied German technique on photoelectric sensors. 7.National patented double speed technique has greatly increased production efficiency. 8.Animal oil filling line is suitable for many items, the adjustment is rapid and high efficient. 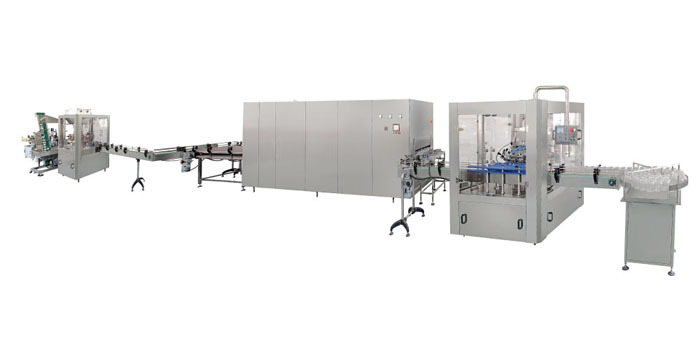 11.Can be used together with the cover screwing &pressing machine, Leakage inspection macing, Aluminum foil operating sealing machine.